While mild thus far, winter is coming to Kansas City. But ‘lo, just in time for the holidays, the city’s favorite Antique Pop duo, Victor & Penny, dumps a treasure trove of cheery music along with deft guitar and lovely ukulele playing to warm cold and possibly bitter hearts. Victor & Penny are back with more poppy pleasures and meandering melodies. Chalk full of twee goodness and charming renditions of old standards and a pleasing original, Side By Side: Songs for Kids of All Ages, is the second album for the merry twosome, which is made up of Jeff Freling and Erin McGrane. Side By Side is truly a team effort comprised of not only the dynamic duo and other area musicians—including Kyle Dahlquist, Larry Garrett, Christian Hankel, James Isaac, Nate Hofer, Rick Willoughby—but also the band’s fans. About 130 backers contributed to Victor & Penny’s Kickstarter campaign this fall to help push the album through the final stages of production. I recommend putting on this album if you’re feeling blue. It is clear Freling and McGrane enjoy what they are doing and the feeling is contagious. The pair leads you through a pleasant journey kicking the tour off with simple and sprightly rendition of “A Smile Will Go a Long, Long Way.” I’ve heard various versions of this song, but I am supremely attracted to how Freling and McGrane arrange and perform it because of the uncomplicatedness. The second track, “Stomp, Stomp,” is certain to get people dancing, or at least chair dancing. It’s a little more of a laid-back cover in comparison to the original, but toe tapping all the same. Though his backing is great throughout the entire album, the use of Rick Willoughby on upright bass is especially helpful in this song. “Slow Poke,” the third track, takes a trip on a winding road in the country. The blend of the old guitar and ukulele is especially nice on this track. A cover of the Star Wars’ “Cantina Band” song shakes off the slowness. The reimagining of the song is very well done. I can’t help but think of the Star Wars scene set in the 1920s in a speakeasy during Prohibition. With contributions of Nate Hofer on lap steel guitar and James Isaac playing clarinet, this song is brilliant. “Pork and Beans” is pretty much a song any kid should adore. The hook and chorus comes alive with the use of the Victor & Penny Pork and Beans Men’s Chorus, which is made up of Dahlquist, Hankel, Willoughby and Freling. McGrane and Freling contribute an original song to the mix with “The Cat, She Played Piano.” The track has a slightly darker tone and sound to it in comparison to the other songs on the album, but delightfully dreary. Victor & Penny met the goal of making an album people of all ages can appreciate. In short, Side By Side is a great mix of songs that an entire family can enjoy. This album should be a go-to when you need a break from the all-holiday-music-all-the-time radio stations, which can make you wish you got that Red Ryder BB Gun so you could shoot your own eye out. It’s a family friendly and enchanting album! This week we’ll be featuring some of the artists playing at Murder Ballad Ball, this Saturday, December 8, at Davey’s Uptown. This will be the fourth annual Murder Ballad Ball, and benefits Midwest Music Foundation. 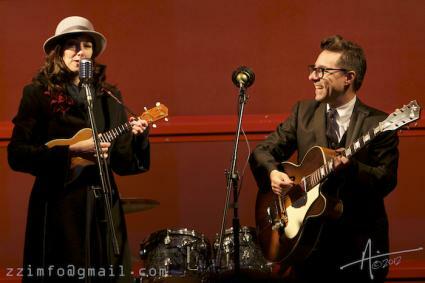 Victor & Penny will be performing at 9:00 pm on Saturday at Murder Ballad Ball. The event kicks off at 7:00 pm at Davey’s. There will be stages on the bar side and on the venue side; the band will be performing on the bar side. Facebook event here. Alicia Houston eats toast, drinks coffee and drives a car. Her view on the Oxford comma continually is up for debate. When she’s had a few beers, Alicia impersonates Katherine Hepburn. She has been writing since she was five and listening to music since she was born. She has a tattoo of a gray unicorn. The unicorn gives her advice and daily affirmations. 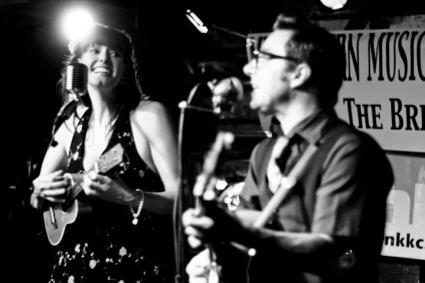 Victor & Penny is the charming, self-proclaimed "Antique Pop" duo of Erin McGrane and Jeff Freling. The two have spent their summer touring the country extensively, and look forward to recording another album this fall. Their unique brand of ukelele and guitar music brings a modern flair to early 20th century songs and a clever, intimate approach to original songs. Victor & Penny: Antique Pop is the popular music from the time when jazz was young, sassy and all the rage—the Top 40 before there was Top 40. V&P: We just returned from an extended summer tour that went really well. We've played over 100 shows so far this year (most of them on the road), traveled 30,000 miles and we're still going strong. We've been touring on and off since last summer and we've learned a lot about the road and ourselves—it's been a fantastic experience. But now, we're home in KC for most of the fall and winter and we're glad to be back in the thick of all the great happenings here. The news is that we're going to record our next album in October here in KC and we're writing songs that will appear on the album alongside more antique pop. The album will appeal to kids of all ages. V&P: First and foremost: going out and seeing live music performance. There's nothing else like the thrilling give-and-take between performer and audience. Secondly, please purchase local music when it's for sale. Many independent artists (especially those on the road) live on the income from merchandise sales. People might not know that the bar doesn't always pay the bands, nor do bands always get the door money. These days, often it's the audience buying merch and tipping the band that is the payment for live music. I'm not saying that's the best system, but it's often the way it is. V&P: KC is exploding with talented artists of all kinds right now—it's hard to choose. But we've been very impressed with the dedication and character of some of the young stars like Enrique Chi (Making Movies) and Hermon Mehari (Diverse). V&P: We love to listen to other independent artists we've met on the road like Tina & Her Pony, Danielle Ate the Sandwich, Brian DeMarco and Lucas Young & The Wilderness. Besides that, the new Fiona Apple album is really interesting. V&P: It's a triple bill: Us, Radiohead and Duke Ellington. V&P: We'd split that 50/50—Erin enjoys the stage most and Jeff enjoys the recording studio. V&P: Erin: Aretha Franklin, Julie Andrews, Ella Fitzgerald and Joy Williams. Why: These are women singers I admire (all for different reasons). 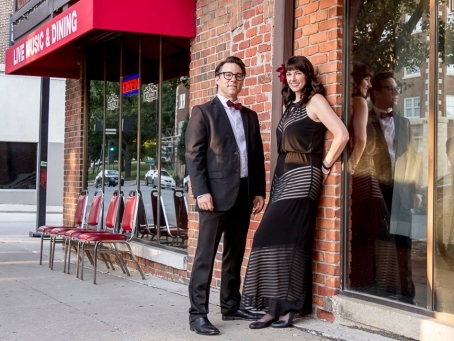 You can hear the delightful sounds of Victor & Penny this Saturday, September 15. They'll be at La Esquina for the Manifest Destiny Art Installation at 2:00 pm, then at Davey's Uptown with Howard Iceberg & The Titanics and Miss Tess and the Talkbacks at 9:00 pm. Michelle is editor-in-chief of The Deli - Kansas City. She also has a weekly column with The Kansas City Star and reviews music for Ink. She plays with Deco Auto, Drew Black and Dirty Electric, and Dolls on Fire. She is lactose intolerant but really enjoys cheese.